The Jelly Roll Sampler Quilt Along Quilt Top is Done! I have a houseguest coming to stay in a few weeks and I wanted her to have a reasonably uncluttered space to be in as the sewing room is also the guest room. I hit the accelerator hard this weekend and got moving on finishing up the Moose Quilts Jelly Roll Sampler Quilt Along. I still have the back to sew together but after that it will be ready to deliver to the long arm quilter. 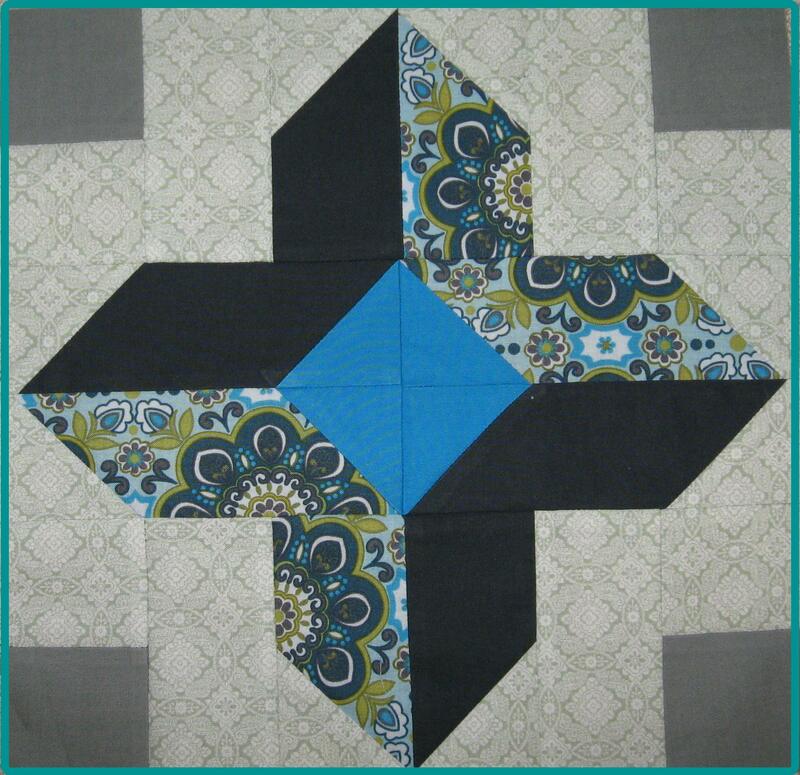 Those of you who have been following along on this blog will know that this top does not 100% contain blocks from the quilt along’s guest designers. I really appreciate their contribution and the effort they went to to design their blocks, but in the end I wanted to be true to my own creative vision. Besides, there were a few blocks, card trick being one example, that I have been wanting to try for a while now. It’s a good thing I wasn’t working with a purchased jelly roll or that wouldn’t have been an option. A big thanks to Konda at Moose on the Porch Quilts for organising this quilt along. It has been a lot of fun. I am still trying to catch up on the Moose Quilts Jelly Roll Quilt Along. Block 8 is one of the ones I decided to replace. I had been intrigued by the Card Trick block for quite a while, as it looked complex and difficult to make. After a particularly frustrating day at work I felt that making this block would either give me a sense of accomplishment or just add to my sense of frustration. I used the cutting instructions in 501 Rotary Cut Quilt Blocks book but they are also available at Quilt.com’s Directions for the Card Trick Quilt Block. I prefer to work from pictures rather than the step by step written instructions, so for me the book was enough. And the conclusion? I found the card trick block difficult to make. It was no problem working out how to organise the components but getting my points aligned and the block to the exact right size was challenging. I have to confess I cheated by resewing part seams to improve the ‘pointiness’ of my points. Oh well. 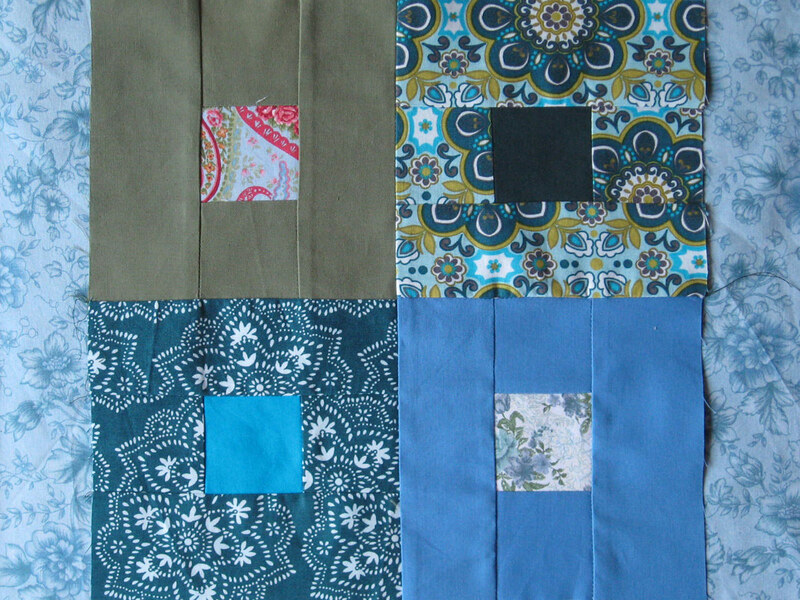 It’s a good thing the reverse of my blocks will be nicely sandwiched and quilted, never to be seen again. I also did Konda’s Block 11 which was a lot of fun to make. I’d been wanting to do a woven look for a while and even posted a message on the quilting board asking for instructions. I didn’t get any replies on the board so was happy when Konda posted the instructions for her block. I was struggling with motivation for a few weeks after I got back from my long vacation in the almost perpetual daylight of nordic summer. Sweden really is the land of the midnight sun and people there do their utmost to utlise that precious time when they can enjoy the warmth and light that summer brings, as the winters are long, cold and dark. Back in Melbourne this winter seems long, cold and dark too, though at least I won’t be shovelling snow at any stage. We had a week or so of record low temperatures and grey days which made it hard to work at either cutting or piecing, or even to take photos for this blog. I prefer to work in natural light when I can. I have finally managed to get back to work. As a start I asked my beloved to change the blade on my Olfa 45mm rotary cutter. He questioned whether it was really necessary, seeing I’d ‘only’ been cutting fabric and with a cutting mat, too. But I reported that the cutting had been getting more difficult all the time and that I was getting ragged cuts that left a few threads uncut. A fresh blade was a good move. After changing it, my cutting zipped along and I was ready to start piecing quite soon. In case you’re wondering why I asked my beloved to change the blade, it’s not because I couldn’t manage it without him, it’s just that tools and blades and sharpening are more his thing. Here is the result. I decided to try a creative approach that might still let me retain the block that had been troubling me, by not using my standard background fabric in block 9 and by using my last strip of pink paisley fabric within the diamond. Not sure if I’m making the design better or worse, but I’m still enjoying the journey. 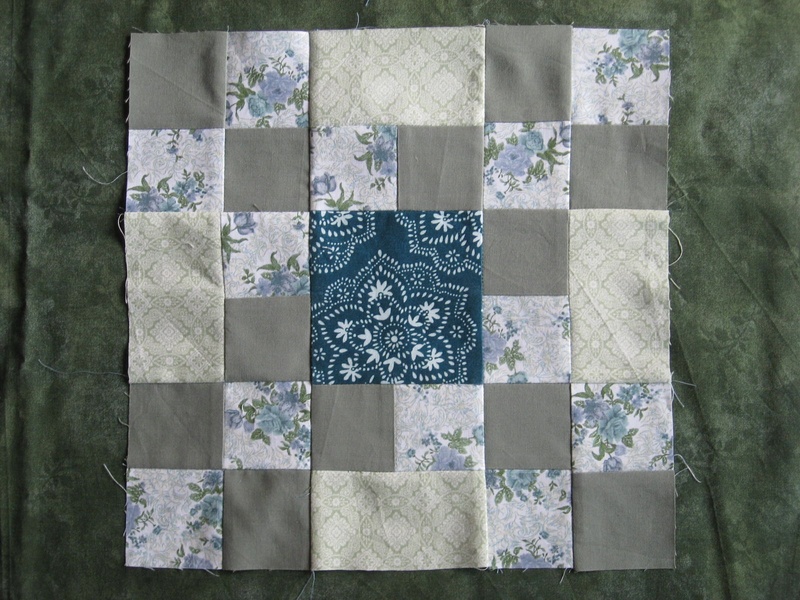 There are still a few quilt along blocks to do, but I’ll catch up eventually. And I’ve decided where the sampler quilt will go when it’s done. There’s a special 40th birthday party coming up in January 2011 and the birthday girl is not into consumer products so will hopefully appreciate a handmade gift. 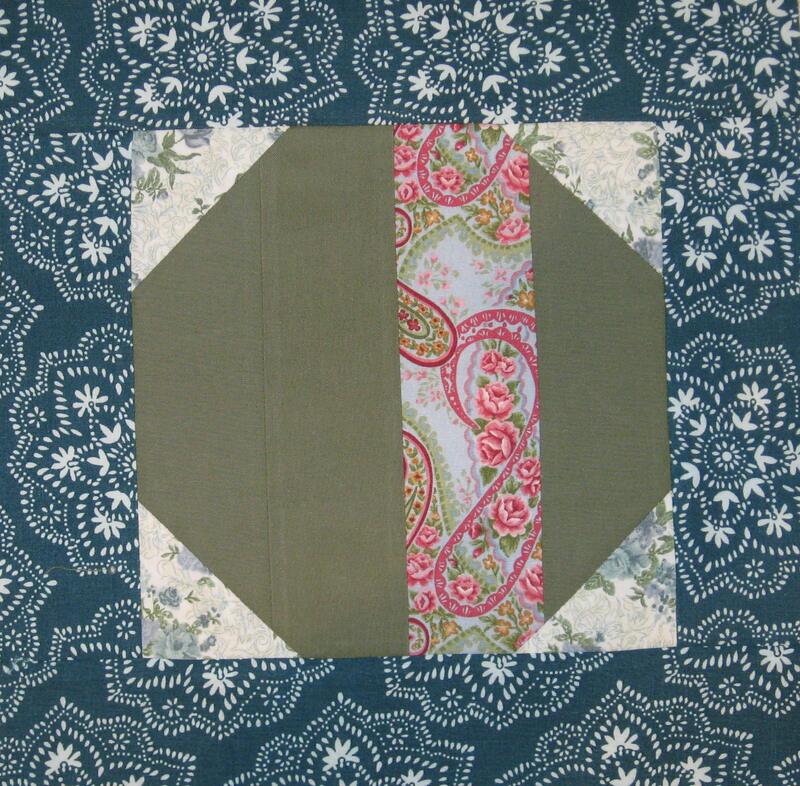 The instructions for jelly roll quilt along block 6 were posted last week. 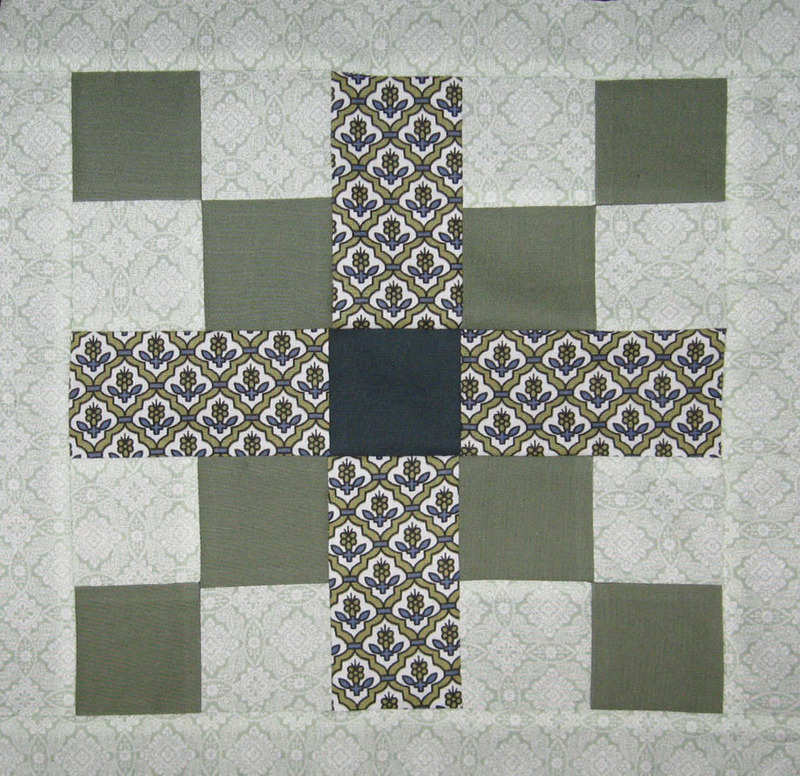 I was relieved to find that I like this block, especially after seeing how others had interpreted the design in their blocks, posted on Flickr. 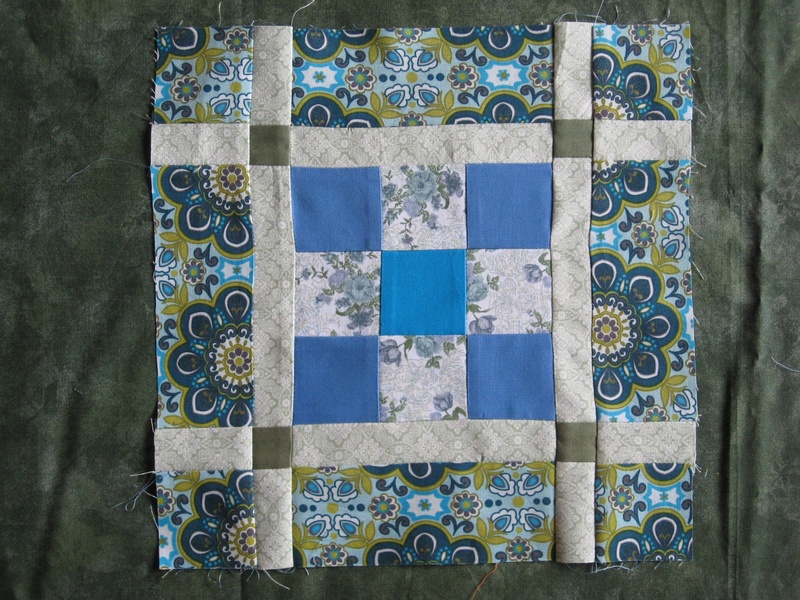 The other quilters gave me some ideas and this block design allowed me to make use of a couple of strips that I had cut too narrow to use on a previous block. I’m frustrated with myself that after six months of cutting and piecing I still make mistakes with something as straightforward as measuring and cutting a 2 1/2 inch strip accurately. One of my previous pottery teachers Jane Sawyer taught me that there is no harm, and indeed great benefit, in ‘showing the hand of the maker’ in your work. I think that an inability to cut a 2 1/2 inch strip correctly is taking that concept a bit far, especially when the fabric is so mis-measured that it can’t be put to its intended use. This block went well in the end and I’m pleased with how it looks. It was a little off square when I finished sewing so I pinned it out against the living room carpet before I went to bed last night. A small amount of gentle stretching overnight did the job to bring it back into shape. 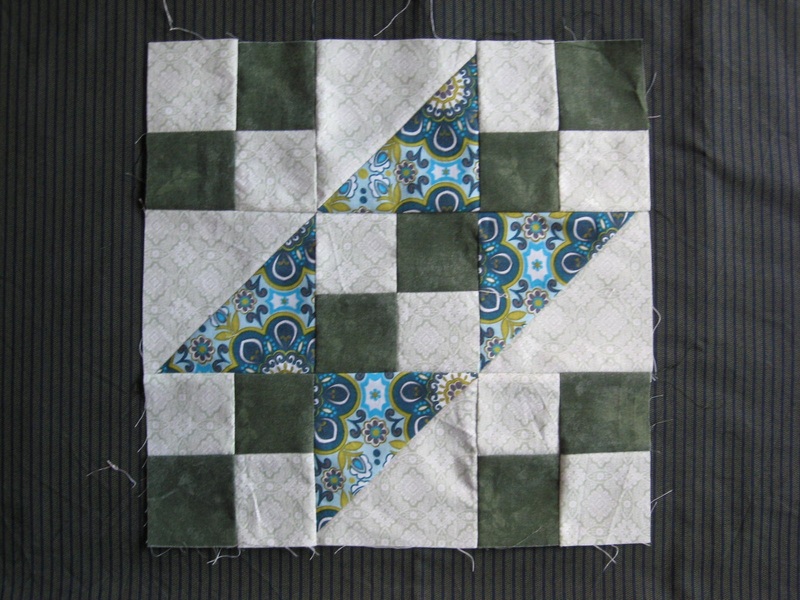 The instructions for jelly roll quilt along block 4 have just been posted. It’s not jumping out at me as a design I like or want to make. 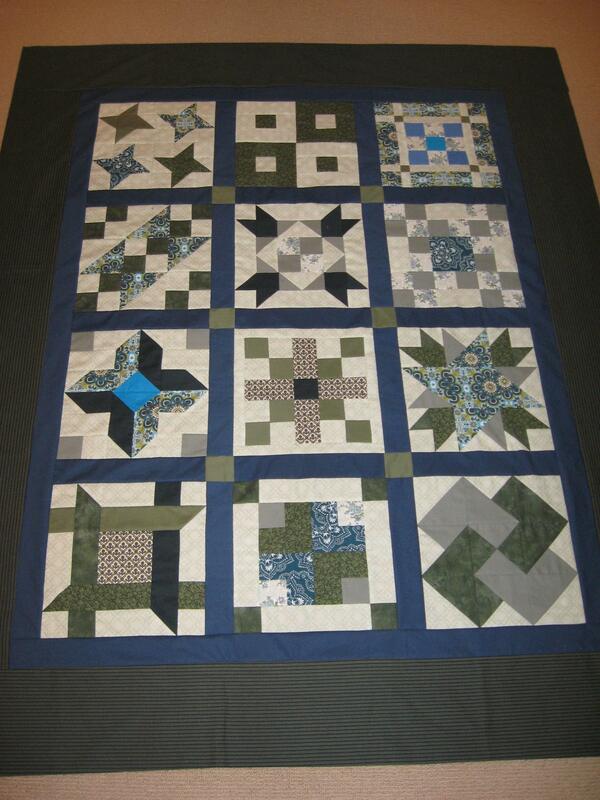 I love what Konda at Moose on the Porch Quilts is doing with this quilt along. Not only has she organised it and found all the marvellous guest designers, but she has been working really hard at giving feedback on the blocks posted on Flickr. In fact, she was even kind enough to leave a comment for me here at this blog. Thank you Konda, I appreciate it. I’m thinking I might just exercise a bit of creative licence and do my own thing with block 4. I’ve spotted a Wagon Tracks Block at Quilters Cache that is more to my taste. I’m not working with a purchased jelly roll as my local fabric store had nothing good to offer. As am cutting my own strips from a stash of green fabrics I had earmarked for a sampler quilt, I can easily cut some slightly larger squares for half square triangles. I definitely plan to keep playing along with the 300 or so others that are doing this quilt along but might not follow this particular block pattern. I’ve heard of the quilt police. Hope there aren’t also quilt along police who will reprimand me for my non-conformance. I decided to join the fun and participate in the Jelly Roll Sampler Quilt Along. The completed blocks are available to view on Flickr and it’s great fun to see what everyone else has come up with. There are 300 members right now. That’s a lot of creative energy all directed at the same task. I’m using scraps as my local Spotlight has exactly one variety of jelly roll, the fabric is wafer thin, I don’t like it much and it’s just under $30. That means more cutting, which is a pain, but there really wasn’t any alternative. My blocks are consistently finishing at 12 inches, not the 12 1/2 they’re supposed to be. Seems my cutting is too fine and my seams aren’t scant enough. I have decided to see the positive and say, “Well, at least I’m consistent,” and just keep going. I can make up the difference by cutting my sashing a little wider.